This is our first collaboration with Clear Tune Monitors though they have been around for quite a while now (2010). CTM, (going forward), hail out of Orlando, Florida and are essentially a family business (Sandra & Cesar), which I find quite common and endearing in the CIEM industry. And that is what they are best known for, custom monitors. Some of the star names on their roster are truly impressive such as Pentatonix, Sepultura, and Accept. The last two of which I pretty much grew up with in my early days covering concerts and album reviews for our local newspapers back in the late 80s. Recently, CTM decided to branch out beyond CIEMs and launch their new Vintage Series. 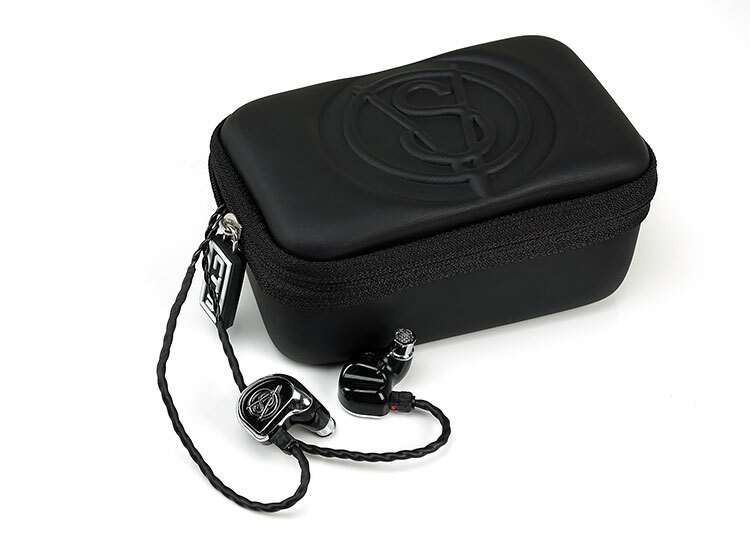 This is the first foray into universal IEMs with the VS-4 their current top of the line 4-driver variant priced at $599. CTM have called this the Vintage Series and there is a fair whiff of Buick chrome and classic jukebox imagery from the get go with the branding, packaging, and design of the VS-4. If I was to take a stab I would say more 50’s era than 60’s, perhaps even post-war 40’s with the beautiful VS insignia reminiscent of those great jazz band and radio label monikers. Every aspect of the pitch, right down to the face plates is harmonious in the legacy era design. If you dig that era, or just love retro design, perhaps watch Grease a little too much on the weekends then the VS-4 will fit in very nicely. Technology wise this is a quad-driver, 3-way in-ear monitor with a 118dB and 18-ohm rating. You get one BA for the highs, 2 for the mids and one larger bass BA for the lows. There is a heavy emphasis on even the TOTL VS-4 being easy to drive on just about any source. 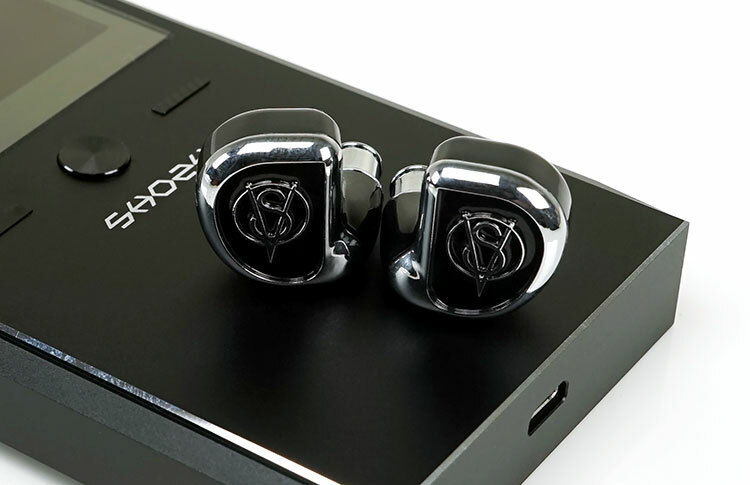 It should appeal to both audiophile and consumer in that respect though at $599 it is right in the same ball park competition wise as established universal designs such as the Noble Audio Savanna and even the IE800. Stiff competition indeed. However, there is more to the design of the VS-4 than a nice flash of chrome and black. 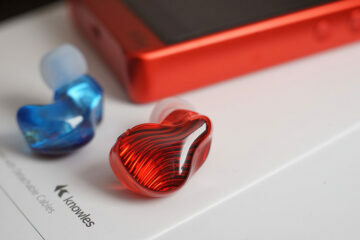 CTM has also tried to translate their CIEM expertise into the fit and comfort of the VS series. 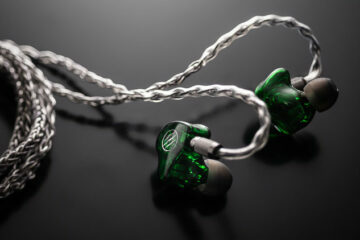 The pitch here for the VS-4 is that the know-how in CIEM design has trickled down into a design that they believe offers a class-leading level of comfort and seal. The VS-4 is a sort of ‘D-type’ shaped shallow chassis design with a short nozzle positioned at the top of the body at a straight angle. The positioning at the front means the majority of the VS-4 form factor has been designed to nestle in the dip of the ear concha just beside the ear canal entry with the cable exit worn over the ear. The inside of the chassis has a very marked wide groove though to compensate for the slight ridge of the concha and anti-helix just beside the ear canal for additional pressure relief. I tend to find that little ridge to be the problem area with some flatter in ear designs so it’s a nice touch. The chassis to nozzle construct is a sweeping design so from the outside it looks quite long however from the inside it is relatively short in terms of protrusion from the base. I wouldn’t call this an overly shallow fitting form factor but the choice of tips will play a role in the final levels of comfort and seal. The VS-4 is a 3-piece design comprising of a mix of hard plastics and alloys. The face plate seems to be a mix of both with a plastic inner and a thick and well-rounded alloy chrome finish on the edges for that distinctive vintage bumper look. In the center, you have a similar chrome finish for the retro logo of the Vintage Series. The central chassis body is comprised of a hardened plastic resin finished in a piano black coating which gives off a fairly subtle sheen. Front and top is the cable termination in the black housing which is a classic 0.78mm 2-pin recessed termination. The wide short single bore nozzle is the 3rd part of the design and is finished in a chrome alloy with a similarly chrome/silver front mesh. The lip for holding the tips is quite subtle and does not protrude much. The VS-4 comes a fairly pliable black cable which I presume to be the usual OFC copper variety which should add a degree of warmth and smoothness to the tonality to the VS-4 but lacks a little in dynamics. It measures approximately 48″ or 1.2m in length, lightly intertwined and very pliant and easy to work with as always. The Y-split is protected by a low profile hard plastic tube with a detachable top that duals as an adjustable chin strap. 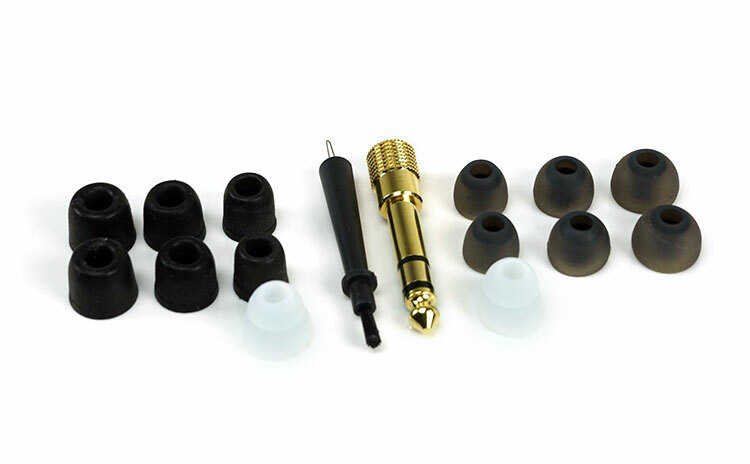 The input is terminated with a short straight angle gold plated 3.5mm stereo jack. This is a decent and comfortable cable to get started with on the VS-4 but my own personal preference is to swap this out with something a bit more dynamic and snappier such as the Silver Litz of the Whiplash Twag V4 or the meaty sparkle of the Lionheart from Effect Audio. The VS-4 has a ton of potential so play around with some cables and see what you can achieve. The grooved recess at the rear of the VS-4 does the trick nicely. This is a comfortable fit with a very good level of seal, especially with the supplied memory foam tips. The relatively straight angle of the nozzle combined with the majority of the body being behind rather than centered has the unusual effect of lifting the bottom of the VS-4 slightly out and the top slightly in so I can see why that recess was created or the pressure would have been uncomfortable on the anti-helix ridge. There are three varieties of tips depending on your preferences. You have single bore silicone and memory foam tips in small medium and large as well as a single set of medium dual flange silicone tips. The memory foam for me provides the more secure fit and seal compared to the more porous but lighter fitting single bore silicone tips. The double flange tips will give you a slightly smoother fit, not quite as secure and isolating as the foams but almost. They do penetrate deeper though than either the foams or single tips which have its own secure fit knock-on effect. Personally, I found the dual flange tips to be the most comfortable compromise of the 3 but the foams had the right tonal balance so I used them for the majority of the review. 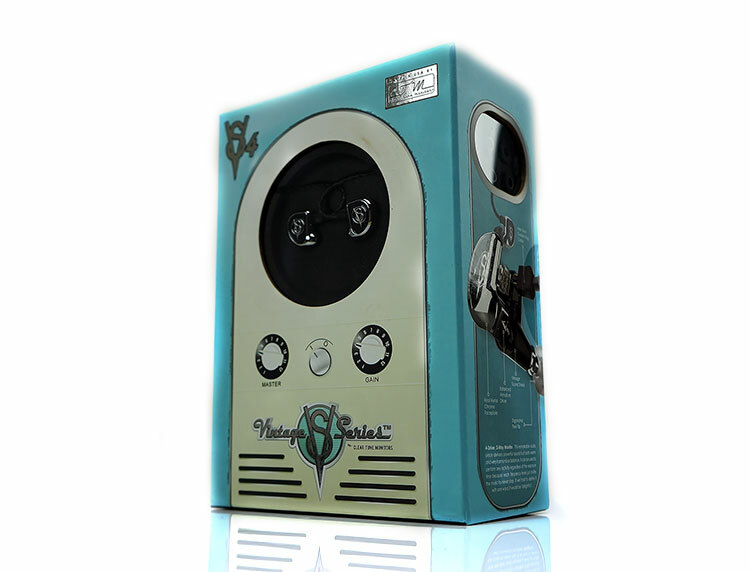 In keeping with the vintage theme, the entire package is retro styled and loosely based on classic guitar amp front facades with a master and gain volume print either side of an “on/off? button and above the Vintage Series big and bold branding moniker. The VS-4 themselves get plenty of room to show off with a clear circular plastic facade right over them on the front of the box. It’s fun, interesting and well done. I have to pay special mention to where they stored the tips, in the side of the foam insert itself. How cool is this that? Very original thinking on how to maximize something that otherwise usually is only for protection. Inside the retail box, CTM has packed the VS-4 box with a more than acceptable range of accessories and large spacious rectangular and semi-stiffened rubber zipper carry case. The zipper itself is encased in a rubberized CTM logo which is nice and ‘grippy’. The case is all in black. It might have been nice for the case to match the box color just for an additional bit of pop. 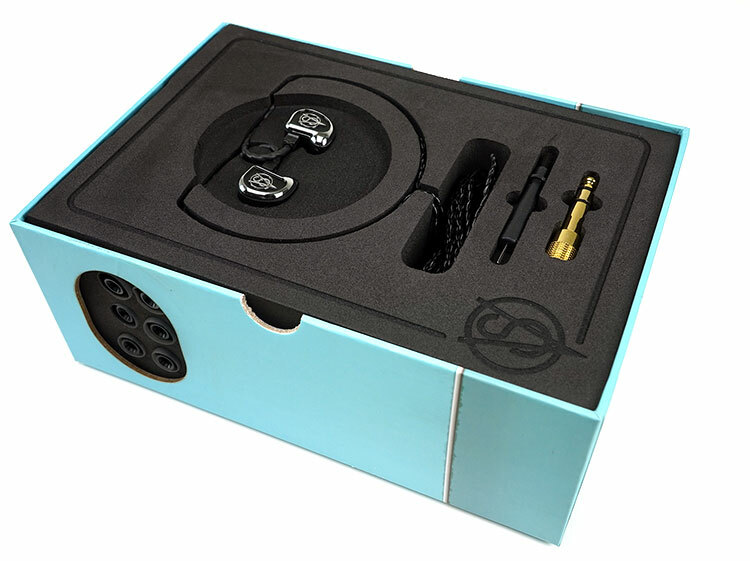 I quite like the pale blue “classic chrome” coloring of the retail package and would have hit the mark if the case carried on from there but since the IEMs are in black I guess we go for the latter. I certainly hope they release the case as an optional extra in a wider scheme of colors, I think there is some life in that. Note inside the carry case there is a little foam holder and upper mesh canopy for holding both your VS-4, cable, tips and quarter jack for on the go. It’s tidy and very functional and much superior to those throwaway OEM pill box cases. The VS-4 has a smooth but marked v-shaped frequency response with a contrasting energetic top end-sparkle, a fairly warm low-end and a recessed mid-range with a vocal delivery that has a slight emphasis, more with female vocals. Overall it’s a classic and fairly coherent delivery and something v-shaped lovers should be quite familiar with. The quad BA design is tight, snappy with good pace and a nice level of detail. The VS-4’s staging isn’t terribly forward or intimate in character but this is not necessarily a huge arena type delivery. There is a slight thickness and reasonable depth and height but there is also a slightly narrow mid-range that’s a touch vague in imaging control. There is a clean attack on vocals suggesting a hint of elevation around the 2k marker as female vocals tend to have a little more snap than lower pitched male vocals. Thankfully, the top and bottom contrast are tastefully done with a lack of sharpness in its treble response to make it a fairly musical and easy to listen to presentation, especially for modern R’n’B, hip-hop, and EDM. Tip choice will tweak the tonality for the VS-4 also. Foams offered the smoothest presentation out of the three and the one I felt most at home with on a personal preference level. The silicone tips (double flange included) lightened the tone a little but at the cost of a little sibilance in the upper mids and vocal delivery. The VS-4 depth and extension are excellent with a tight snappy delivery though sub-bass presence tails off just slightly compared to mid-bass warmth around 80-200Hz. I would not call it rolled off though, just a natural response of a low-end bass armature driver which is known more for definition and speed than sheer weight and rumbling presence. You will have an audible presence down to 30Hz it’s just not overwhelming which in my book is a good thing. Beyond its mid-bass response, the VS-4 dips smoothly into the lower mids preventing unnecessary bass bleed into the mids as well as allowing instruments to retain good levels of clarity and separation. The bass to lower-mids dip isn’t overly exaggerated so you will not find any major “disconnect” between the low end and mids but it will mean instrumental positioning will fall back a bit hence the slightly less than intimate nature of the VS-4 delivery. Generally speaking, the VS-4 mids will sound recessed though and a little more narrow and center focused. Instrumental notes have decent body but perhaps lacking a little in precise imaging control and airiness. This usually plays out well with sparse arrangements such as modern R’n’B and EDM which puts more emphasis on bass and treble/vocals but less so with classic rock and modern metal (lower mids to mids). Instrumental timbre is warm to neutral with a clean attack, decent sustain and a relatively natural sounding decay. Vocals also have a warm to neutral tilt though the leading attack in its vocal delivery has a slightly hard tone to it that can come close to passages of sibilance, more so with female vocals. I say close, more of a hard edge than outright sibilance except for the breathiest of vocals. There is a touch of boosting around 1-2k so vocals do not fall too much into the mix. Higher pitched vocals benefit more than guttural lower pitched male grunts with this tuning. The VS-4 has a more forward treble response with plenty of sparkle in its lower treble but tuned just shy of being overly boosted so whilst there is very clean and clear with decent extension and good air I never got a fatiguing after taste. Post 7-8k the FR drops down a bit with a hard 16k stop in its range. It has enough energy around 4-7k to provide a decent level of contrast with its warmer bass performance and keep things “exciting” sounding and certainly, it does not sound shelved down or overly smoothed over. Classic Knowles sound in some respects. Certainly, the VS-4 harmonic balance, particularly in its treble FR, keeps partial overtones and other ‘nasties’ fairly well under control. Yes, there is the odd time I feel odd harmonics are a little more prominent than even harmonics, especially on percussive passages but not excessively so. What that means is things like triangle hits are prominent, clear and focused but not overly edgy or harsh sounding.